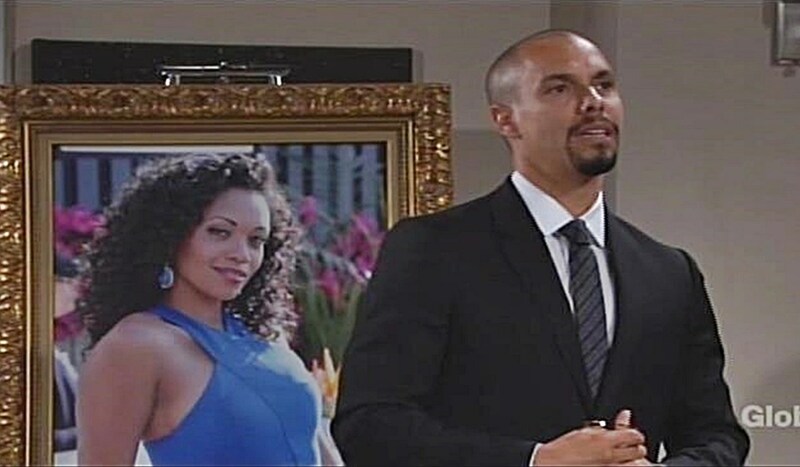 Wednesday August 1, 2018: Devon holds Hilary's funeral service and reception, Phyllis reads a note from Hilary, and Mariah discovers what Mark was to Hilary. Devon is dressed for the funeral at the penthouse when Neil and Nate arrive. Nate reports Cane and Lily are next door with the kids. Devon says Shauna’s upstairs. He worries he hasn’t done enough, and becomes tense over finding his tie. When he goes upstairs, Nate reminds Neil there’s no timeline for dealing with grief. Lily arrives as Devon reappears. They hug. Nate and Neil leave. Shauna listens in as Lily tells Devon she feels guilty about how she treated Hilary; he loved her. Devon reminds her they made peace, that’s all that counts. Across the hall, Charlie tells Cane he’s upset about hiding the truth, and asking Shauna to do it. Jack arrives at Phyllis’ place. He offers her a ride to the chapel unless she’s expecting Billy. Phyllis doubts he’ll show. At Sharon’s place, Mariah’s pleased that her mother plans to join her at Hilary’s funeral for moral support. At the church, Devon places his hand on Hilary’s casket. At the reception in Devon’s penthouse after the service, Neil assures his son it was exactly what Hilary would have wanted. Billy is there and tells Phyllis he wouldn’t have missed it, Hilary was a friend. Devon makes a speech about Hilary; a star who shone brightly. He and Mariah smile about her stubbornness. Devon recalls their passion tore them apart – he regrets that – but Hilary persisted. She wanted to have a child together, and he realized he’d never stopped loving his wife. Devon knows she’s making heaven a more beautiful and interesting place. They all raise a glass to Hilary. Jack speaks about being Hilary’s friend and her strongest qualities. He remembers when she talked about the perfect father for her child, and he told her she was describing Devon. He hopes she inspires all of them to get the truth out there. Shauna wants to go next. Cane and Charlie look uncomfortable as she cries that Hilary took her in; she trusted her. Charlie takes her arm, and Neil takes over. He ruminates about his complicated relationship with Hilary. He wishes he’d learned the power of forgiveness sooner. Victoria and Nick make amends.